Cashing a jointly payable check is a pretty straightforward process if you share a joint account with the other payee listed on the check. However, a joint account is not required to cash a check that has been made out to you and another person. That being said, the specific steps you need to take to cash the check depend largely on the policies of your financial institution or establishment where the check is being cashed. Also, the wording on the actual check itself plays a major role. When you are issued a check, take notice of the wording on the "Pay to the order of" line. Does it include the words “and” or “or”? Although the wording may seem like semantics, it lets the bank or check cashing establishment know who needs to endorse the check when it is presented for payment. When the check is written to Person A and Person B, both parties must endorse the check. But when the check is written to Person A or Person B, then either person listed on the check may endorse it. If the check’s writer does not include these stipulations when filling out the check, then the banking institution will treat the check as if is written to Person A or Person B, and as a result, anyone named on the check may endorse and deposit or cash it. The wording on the check also determines where the check can be deposited. If the check is written to you or another party, then you or the other person can deposit the check into an individual account. But, if the check is written to you and another person, you may have to deposit the check into a joint account as per your bank's internal policies. Checks made out to you or someone else are much easier to handle than those made out to you and another party. Banks assume more risk with these types of checks, so many require both you and the other person to have a joint account or come into the bank together to endorse the check. Many of the largest banks in the U.S., including Citibank, Chase and Wells Fargo, require that all parties endorse the check and come into the branch to show valid government-issued identification to verify signatures. If you are trying to deposit a federal or state tax refund check, some banks such as Bank of America, TD Bank and BB&T require all payees to have a joint account before depositing a check made out to multiple parties. Can Somebody Else Cash an IRS Refund Check? 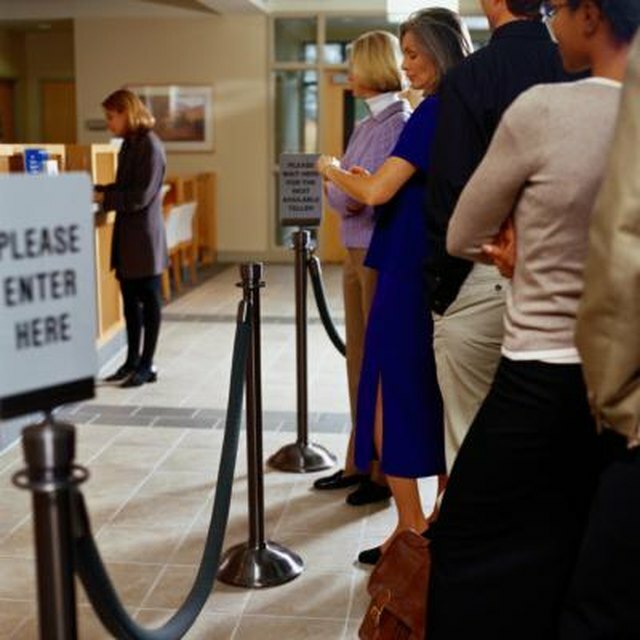 If you’re having trouble depositing a joint check at a traditional banking institution, or do not have a bank account, you can try cashing it using a check cashing service found in grocery stores or standalone establishments. Although you will have to pay fees when you cash a check using this option, it does not require a joint account. Walmart, for example, will cash payroll checks, tax refunds and 401(k) disbursement checks, as well as cashier's checks made out to two parties. First Quarter Finance: Does Walmart Cash Two Party Checks?